In anticipation of its debut at the L.A. Auto Show, Subaru has released a teaser image of the new Ascent 3-row crossover. Sometimes when car companies do these shadowy teaser shots, a little shadow recovery can reveal the rest of the car. 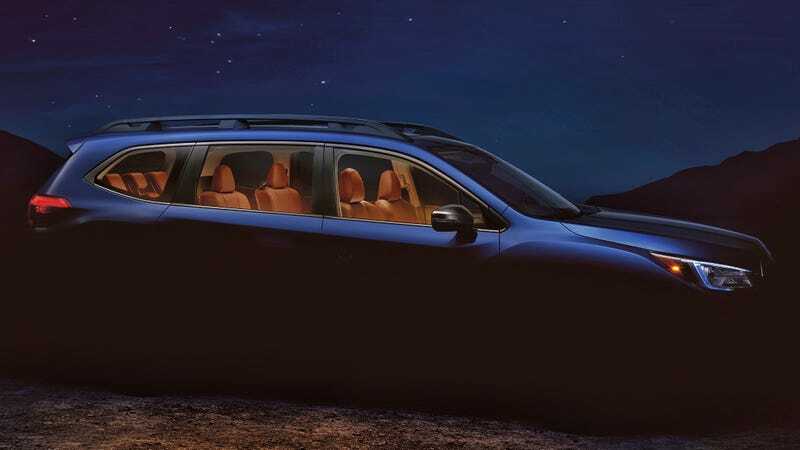 But Subaru fully blacked out the bottom half of the Ascent in this rendering. Here’s the original image from which I still was able to at least get some more detail of the top half of the Ascent. But no matter how much I crank up the shadow recovery into the land of extreme shadow recovery, there’s nothing there but pervasive, empty darkness. Subaru really wants to make us wait until later today when the whole car debuts, I guess. I’m prepared to see loads of these running around here in Madison, just like every other Subaru model that’s not one of the fun ones.